Normally found on powerful home cinema speakers, the KEF badge on this novel iPod system guarantees some serious audio prowess. The bitrate that your iPod music is encoded in will decide how much, of course, but the Picoforte One - an even meatier Picoforte Three model is also available - offers some serious all-round power. Comprising a separate iPod dock and amplifier, this tiny stack system's core styling rounds on its two egg-shaped speakers. The dock and the amp themselves are made of die-cast zinc and although a mess of cables needed to attach each component to one another will need to be carefully shielded from view, it's a simple process to connect the dock to the amp and the amp to the speakers - especially since all cables are provided. Maximum appeal comes by dint of nine iPod cradles, which cover every single iPod we could think of. If you've an iPod Video/Photo this dock might be worth considering because the dock can be attached to a TV using a S-video cable, although that isn't included. It's a great feature if you've encoded some DVDs to watch on-the-go. Precise with a wide frequency range, its 25W speakers bring out impressive detail from Gruff Rhys' Candylion long-player, encoded at 192 kbps. 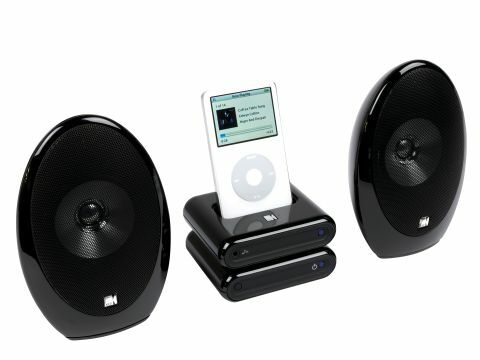 Attach a subwoofer to the amp's dedicated output and you'll have one of the best iPod hi-fi's around, although its cable-tastic appearance and high price do narrow its appeal.